Note: The Yokohama call has been dropped and ships now proceed direct to Yantian (19.07.17). 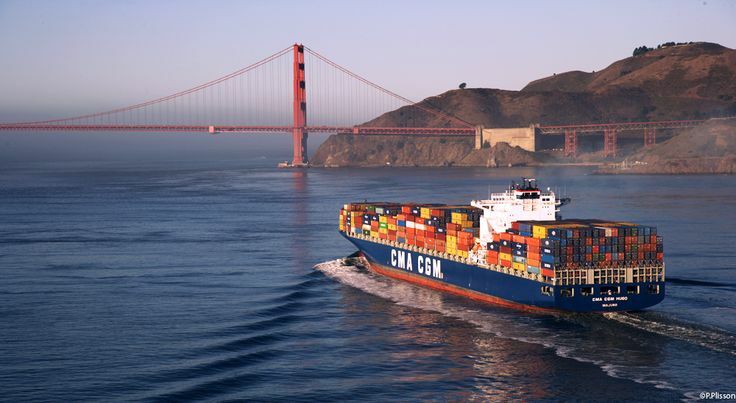 With the annoucement by CMA CGM of its new Columbus PNW service, North America is gaining a regular sea travel connection to Asia. Effective this spring, three French-flag ships will be sailing from Seattle and Vancouver to Yantian, in the Shenzen district near Hong Kong, on a regular basis. The first passenger sailing was by the the CMA CGM Rigoletto from Seattle on April 30 and Vancouver on May 2, arriving at Yokohama on May 16. The fare for the 20-day voyage from Vancouver to Yantian is €2,200 per person double and €2,400 for sole use of a double cabin. Sister ship CMA CGM Medea will charge the same fares. Each is fitted with three twin cabins, one double and one single, measuring between 200 and 250 sq ft each. The third ship, however, the CMA CGM Fidelio, is fitted with two very large VIP suites, measuring 355 sq ft each. The Fidelio sailed from Seattle on May 20 and Vancouver on May 22, arriving Yokohama on June 7. The VIP suite fare from Vancouver to Yokohama is €130 per person per day double and €150 per day for sole use of a suite and she will return every 42 days thereafter. For further details on any CMA CGM voyage please contact Miri Lopusna at The Cruise People Ltd in London on +44 (0)20 7723 2450 or email PassageEnquiry@aol.com. Cruise in the new 2,900-berth 117,000-ton Celebrity Edge from Fort Lauderdale to St Maarten, St Thomas and Nassau, departing for 7 nights on December 23, 2018. Cruise-only fares start from £1,444 person in an inside cabin, £1,804 in an outside or £2,014 in a balcony cabin, and include port charges, government fees and gratuities. Book an Oceanview stateroom or above and be rewarded with a free Classic Drinks Package. A CMA CGM container ship approaches the Golden Gate Bridge at dawn, en route to sea. Until recently, the well-known Columbus Loop service ran from the North American East Coast to Asia via the Cape of Good Hope and on to Seattle and Vancouver, with return to New York via Asia and Suez. But all is about to change as the main Columbus Loop service, now called Columbus Jax, relocates its West Coast port turnarounds to Los Angeles and Oakland, California. Through the Columbus Loop it was possible to build a round-the-world trip between Halifax, New York and other US East Coast ports and the West Coast ports of Seattle and Vancouver via Asia and return to the other coast by train. This will still be possible but Seattle and Vancouver will now be replaced by Los Angeles, where CMA CGM has recently acquired the dedicated APL container terminal at Terminal Island, and Oakland. In lieu of through service to East Coast ports via Suez, Seattle and Vancouver will now get a separate 42-day service called Columbus PNW, that will connect with Yantian, Xiamen, Ningbo, Shanghai and Pusan before returning to Seattle. Two French-flag ships now serve this route, with the 7-passenger CMA CGM Norma and CMA CGM Rigoletto carrying passengers with sailings once or twice a month. The APL Phoenix and APL Columbus now carry four passengers each in two Owners Cabins on the Columbus Jax route. The Columbus Jax route will feature eleven passenger-carrying vesels, an increase from eight on Columbus Loop. These ships, which will sail about every 11 days, include the 10-passenger CMA CGM Nabucco* and APL Danube, CMA CGM Elbe, CMA CGM Loire, CMA CGM Rhone, CMA CGM Tage and CMA CGM Thames and 8-berth CMA CMA CGM Figaro* and CMA CGM La Scala and 4-berth APL Columbus and APL Phoenix. *French-flag ships. Hong Kong and Singapore feature prominently on this route, with Oakland to Hong Kong taking 16 days, Hong Kong to Halifax 30 days, Singapore to Halifax 25 days and Singapore to New York 28 days via Suez, as examples. Among them these 11 ships have berths for 94 passengers. Fares vary between €100 and €110 per person per day double and €110 to €130 per day for singles. Full US visa (not just an ESTA) is required for non-US and Canadian citizens calling at US ports. For details on any CMA CGM passenger booking please call Miri Lopusna at The Cruise People Ltd in London on +44 (0)20 7723 2450 or email PassageEnquiry@aol.com. As we reported in August 2014, 4,000 lower berths seemed to be developing as the new norm for cruise ships. But things have changed once again. With Norwegian’s reveal of its five new “Leonardo” class ships, today’s target size has come down to 3,300 berths, compared to the 4,000 plus of its previous ships. With the exception of Celebrity, whose exisiting “Solstice” class and planned “Edge” class ships are almost the same size, other lines such as Royal Caribbean and MSC Cruises are doing much the same. On the management side, it has been announced today that Carnival UK will have a new boss from May, when Josh Weinstein moves from Miami to Southampton as president. In a significant reorganisation, Carnival UK will now report to group chief executive Stein Kruse in Seattle. Finally, Costa Cruises is adding another Spanish base port, in Tarragona. With two ships being transferred in from its Liberty Bridge service and two more from Pacific Express 3, CMA CGM’s Amerigo Express service is now up to four passenger-carrying ships running between Mediterranean ports and US ports between New York and Miami. With a 42-day round voyage, four ships means a departure on average every ten days. Two ships don’t carry passengers, meaning passenger service four weeks out of six, or good year-round coverage, with more than 30 sailings a year in each direction. Ports served in the US include New York, Norfolk, Savannah and Miami, while Mediterranean calls are made at Algeciras, Malta, Salerno, Livorno, Genoa, For-sur-Mer, Barcelona and Valencia before returning to New York. The CMA CGM Amber and CMA CGM Coral, transferred in from the Liberty Bridge service, each carry five passengers in one Owners Double cabin and three Singles, while the CMA CGM Florida and CMA CGM Georgia (above), which came from Pacific Express 3, carry six passengers in two Double cabins and one Twin cabin. Typical Amerigo Express fares are Genoa to New York (15 days, €1,915), Barcelona to New York (12 days, €1,795), New York to Genoa (27 days, €3,355), New York to Algeciras (18 days, €2,275), Miami to Genoa (20 days, €2,515) and Miami to Algeciras (11 days, €1,655). Fares include booking fee and helicopter evacuation insurance. Please apply for other ports. Meanwhile, the CMA CGM La Traviata has replaced the CMA CGM Amber and CMA CGM Opal on the Liberty Bridge service, with seven passenger berths offered in two Twin cabins and three Singles. The route is Le Havre to New York, Norfolk, Savannah and Charleston, with return to Southampton, Antwerp, Rotterdam, Bremerhaven and Le Havre, with a sailing every 35 days. For further details on any of these North Atlantic routes please call Miri Lopusna at The Cruise People Ltd in London on +44 (0)20 7723 2450 or email PassageEnquiry@aol.com. For years now, since Safmarine’s “Big Whites” disappeared, passengers have sought a means of travelling by sea to and from the Canary Islands. But cargo ships have only offered round trip voyages between north Europe and the islands. Now, however, we are able to offer a 10-day voyage in each direction on the 44,135-ton Tim S, with a three-week interlude in the Canaries. Ports of call for this voyage after leaving Antwerp are Le Havre, Sines and Casablanca, and on the northbound voyage just Le Havre. The ship, built in 2005, features one double-bedded Owners Cabin and two Single Cabins and is operated from Antwerp by R Schepers & Co.
As the Tim S is engaged in the West Africa trade, and passengers are not allowed on board for those calls, she effectively has to disembark all passengers at Las Palmas. She then spends 22 days running down the West African coast before turning up in Las Palmas harbour again three weeks later for her return trip to Antwerp. The voyage in either direction between Antwerp and Las Palmas takes 10 days and the passenger fare is €1,202 (about £1,085) per person in either direction, including port charges, deviation insurance and booking fee. For further details please call Miri Lopusna at The Cruise People Ltd in London on +44 (0)20 7723 2450 or email PassageEnquity@aol.com. The first of the 117,000-ton Celebrity “Edge” class ships enters service from Fort Lauderdale in December 2018. Last week, on the event of Seatrade Cruise Global in Fort Lauderdale, Celebrity Cruises released the first detailed images of its five new 2,900-berth “Edge” class ships. Also from Miami comes word of orders for four X-Bow expedition cruise ships for Sunstone Ships. On the other side of the Atlantic, meanwhile, the UK’s Arena Travel announced its acquisition of The River Cruise Line and the UK & Ireland hit a new cruise record with 1.9 million cruisers in 2016, although this is still short of Germany’s 2.02 million.